1. It Brings Everyone Together. If you family is anything like mine, you are busy. Doing laundry, cleaning the house, taking kids to school, going to work, running errands, running kids to after-school and church activities, running, running, and more running. Despite the busyness in my day, I know that no matter what, dinner time is coming! It's a time when no matter what our schedules have been like, we all will come together to enjoy each other and a good meal. We laugh together about the day and talk about things that are on our hearts. There are so many things in this world grasping for our time and attention - even for the attention of our children. When we all come together to share a meal, the TV goes off, the computer is shut down, and our cellphones stay in the other room. For that time in the day, nothing else captures our attention but each other - and I wouldn't have it any other way. 2. It Encourages You To Eat Healthier. I love cooking for my family! One of those reasons, is that making a home cooked meal not only taste better, but I like knowing that I'm not putting all of those added preservatives and chemicals that come from eating prepackaged and canned foods into my body - or my families bodies. According to Cornell University, children from families who eat regular meals together are "35% less likely to engage in an eating disorder, 24% more likely to eat healthy foods, and %12 less likely to be obese. * There's something about sitting down together around the dinner table that makes the meal seem to deserve something a little more fancy -something a little finer than just a "meal in a box". I'll be honest, when it's just me - I'm more inclined to take the easy road and throw a box of chicken nuggets in the oven - but when I know my whole family is sitting around the table - it gives me the little extra incentive I need to make the night a little bit "fancier" just for them. Let's face it, in the busy times we live in, anytime your whole family is all together in one place is a special occasion. It's this attitude about our family dinner nights that helps encourage me to cook from scratch - and it always keeps my whole family coming back for more! 3. It Keeps Your Calendar Up-To-Date. "Mom!" "Don't forget my field trip this Friday." "I have to bring a packed lunch." "Mom! "I'm staying after school on Tuesday for violin." "Honey, I invited R.J. and Jessica over for dinner on Sunday night - you should make your Tortilla soup and cornbread"... With four kids and a husband who loves to socialize it sometimes gets pretty difficult to keep all the activities and events straight. Even though I try to write everything down on our calendar, there are just some things I forget from time to time. Some weeks the days seems to fly by, leaving me thinking I have a week to bake cupcakes for a school fundraiser, only to find out they are needed the next morning. To keep our schedules straight, we use our family dinner time to talk about the week's schedule. No one is more excited about their upcoming birthday parties, school trips, or church events that my own kids - and I can always count on them to remind me, every night at dinner, what events I should be prepared for. Our family meal times not only help me stay on track and not struggle to finish plans at the last minute, but also show my kids that I care and I want to know all about the events and activities they are a part of. 4. It Won't Last Forever. Growing up in a single-parent home, I knew the love of my Mother, but I always doubted the love of my Father, who never really seemed to be around. Even though my Mom had to work hard to make ends meet, and dinners were not always the most lavish meals, she always did her best to make each one feel special. We always ate them together, and through this, I always knew her love for me was true. Without a doubt, every time I fill my own table with dinner dishes, I remember her love for me. It's that same love, that now moves through my heart and is shared with my own children. She set the example; the example that was set for her when she was a child by my Grandma and Granddad, and now the example I set for my own children. Three generations of not only tradition - but also of love. On days that I don't feel like cooking, or times where it just might seem easier to feed the kids and get that extra load of laundry done and put away, I remember the importance of tradition. Someday, I want my children to experience their own family dinner traditions. I want them to experience all of the love they will give and receive through sitting around together at the table. I want them to share in the joys and the stories, the funny moments and the serious ones. I want them to carry on the tradition, not because it's what I did when they were growing up, but because I want my children to pass on that same love that is known, when everything else is put aside, even if its just for a few moments, around the dinner table. 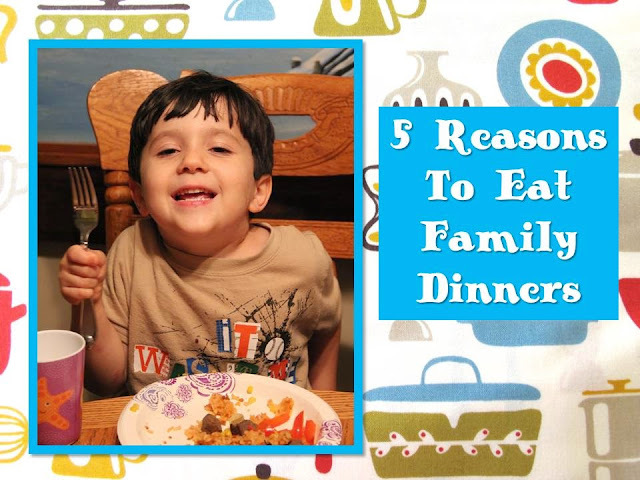 What do you love about family dinners?